Kids today are used to having electronic devices all the time to entertain them. So, when Thing 1 got in trouble and lost all “screen time” (TV, video games) privileges for the day, he was forced to use creativity to entertain himself. 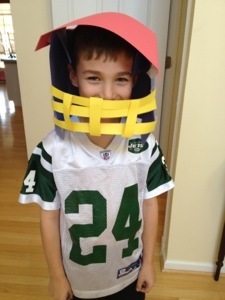 He came up with the Origami Football Helmet.